Ever had that sinking feeling when the 5 MB drawing tht a you have spent the last 2 years working on won’t save the latest updates and reports invalid data or corrupt file? Scary as this may seem there are steps you can take to clean up your DWG and sleep again. Custom toolbars are a great way for AcceliCAD users to provide all the design and drawing tools they use most often in a single toolbar or toolbar suite. You can turn off default toolbars that contain tools you never use and regain valuable screen area. Custom toolbars are are portable and easy to share between computers and a great to standardize your design and drawing environment. Getting your CAD system set up for productive work requires you to make some important decisions before you actually start drawing. The connection between lines, layers and colors is a fundamental concept to understand before proceeding. IntelliCAD Explorer looks and operates much like the Windows Explorer, but it is geared to showing and manipulating the components inside drawing files and setting their properties. Drawing components include Layers, Linetypes, Styles, Coordinate Systems, Views, Blocks, Dimension Styles. A frequent need in CAD is to use a set of pre-drawn symbols, such as schematic symbols in electronics or piping. Some CAD products have special provision for symbol libraries and provide a system for selecting items from the libraries by picking from illustrations of the items. Usually the sets of symbols are stored in some special file format as a library, and there may be separate libraries for various fields of work. To really use paper space effectively, we need to understand how to set up layers and dimensions. This article continues on from Modelspace & Paperspace I. Regardless of whether you’re learning or re-learning CAD, it’s important to understand the concepts of model and paper space. Line weights, or the varying line thicknesses used in engineering drawing, are essential in creating a drawing that communicates efficiently. Layers are another important way you can control your information and build intelligence into your design drawings. Dimensions are fundamental components of most engineering drawings, but the challenge of wrestling with 59 dimension variables is often daunting. Here we provide a couple of simple techniques to keep you on track. 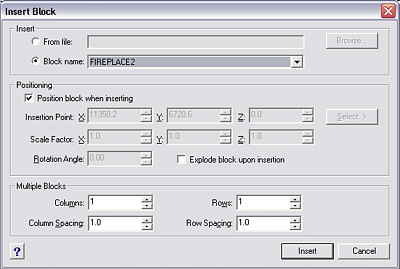 When you create dimensions in IntelliCAD or AutoCAD, the dimensioning components such as extension lines, arrowheads, dimension lines, and dimension text are placed on the on the current layer. The first time dimensions are added to a drawing, IntelliCAD 98 also creates a special layer named “DEFPOINTS”. This layer holds the “definition points” for the dimension. By default this layer does not and cannot be made to print.